Spa Retreat, Rooms from INR 28,000 per night. Spa Retreat, Rooms from INR 28,000 per night + Breakfast for two people The Oberoi Beach Resort, Al Zorah, Dubai. Experience a relaxing spa retreat at The Oberoi Beach Resort, Al Zorah. Take a short flight from Dubai and discover a luxury escape nestled within one million square metres of protected mangrove forest. Pause. Inhale. Unwind. Offer Inclusions: Minimum two nights stay in Premier room on double occupancy. Breakfast for two people per night. One 60 minute spa treatment for two people per stay. One 45 minutes Yoga session. Book Now. Red Sea Adventure, From Euro 209/night. Red Sea Adventure, From Euro 209/night +Daily breakfast + Return airport transfers The Oberoi, Sahl Hasheesh, Egypt. Dotted with rich and varied coral reefs and fringed by ancient ports, the Red Sea is unique as it is home to about 20 percent of the endemic fish species of the world. The crystal clear underwater gardens are a diver's paradise, enchanting travelers to return again and again. The Oberoi, Sahl Hasheesh has a PADI on site certified dive centre located at the beach front. The house reef in front of the resort and the numerous dive sites in the open sea offer a myriad of options to the first time and experienced divers. Book Now. Best of Mauritius and Dubai, Rooms from Euro 595/night. Best of Mauritius and Dubai, Rooms from Euro 595/night + WiFi+ Daily breakfast Oberoi Hotels & Resorts. Pristine beaches, clear blue waters and spectacular sunsets now come with an exceptional shopping experience, desert safaris and the stunning Burj Khalifa. Enjoy a complimentary night stay at The Oberoi, Dubai when you take a holiday at The Oberoi, Mauritius. Quite simply, the best of both worlds! Book Now. Stay 5 Nights at The Oberoi, Bali Get 1 Night Complimentary Stay. Stay 5 Nights at The Oberoi, Bali Get 1 Night Complimentary Stay at The Oberoi, Dubai. Discover the island paradise of Bali. Explore sophisticated, fashionable Seminyak beach. Relax in our expansive tropical gardens and indulge in our exquisite spa. Stay with us at The Oberoi, Bali and you can also enjoy complimentary nights at The Oberoi, Dubai. Unwind with our legendary hospitality and delight in the spectacular views of the iconic Burj Khalifa from our spacious rooms and suites. Lombok via Dubai, Daily breakfast + WiFi + Return airport transfers Oberoi Hotels & Resorts. Located on Medana Bay, with exclusive beach access and sunset views of Bali's Mount Agung, The Oberoi, Lombok is a magnificent island escape. Stay with us here and you can also enjoy complimentary nights at The Oberoi, Dubai. Unwind with our legendary hospitality and delight in the spectacular views of the iconic Burj Khalifa from our spacious rooms and suites. Exotic Escape, Rooms from Euro 1,070/night. Exotic Escape, Rooms from Euro 1,070/night + Daily breakfast + WiFi + Return airport transfers The Oberoi, Mauritius. Located a comfortable fifteen kilometres from the capital, Port Louis, The Oberoi, Mauritius spans twenty, verdant, beachside acres and is home to four, recognised national monuments that date back to 19th century French Colonial times. This luxury resort has an unrivalled position on the white sandy shores of Turtle Bay, a natural marine park with a vibrant coral reef. Situated on the northwest coast of the island, The Oberoi, Mauritius enjoys magnificent sunset views, every day. Exotic Escape offer for Mauritius is valid for a minimum stay of 5 nights. Book Now. Advance Purchase Offer, Get 50% Savings. Advance Purchase Offer, 50% Savings + Complimentary fourth night The Oberoi Hotel, India. A night with our compliments. Book Himalayan Vacations offer till 14th October for three consecutive paid nights and enjoy a complimentary fourth night for stays between 5th October and 30th November, 2018. Participating hotels: Wildflower Hall, Shimla in the Himalayas and The Oberoi Cecil, Shimla. Enjoy 50% savings. Book Unforgettable Holidays offer till 14th October for stays between 5th October and 30th November, 2018 and enjoy 50% savings on a third night's stay. Participating hotels: The Oberoi Rajvilas, Jaipur; The Oberoi Udaivilas, Udaipur; The Oberoi Amarvilas, Agra and The Oberoi Vanyavilas, Ranthambhore. Himalayan Wellness, Rooms from INR 25,000. Himalayan Wellness, Rooms from INR 25,000 + Daily breakfast + Free Transfers The Oberoi Sukhvilas Resort & Spa, Chandigarh. Immerse yourself in nature surrounded by 8,000 acres of forest at the foothills of the Himalayas. Located just thirty minutes from Chandigarh city centre, The Oberoi Sukhvilas Resort & Spa, Siswan Forest is perfectly located for you to take some time out for yourself. Experience the Japanese tradition of forest bathing, Oberoi signature massage treatments and hydrotherapies, all complimented by our legendary hospitality. Treat yourself. You're worth it. Offer valid from 1st October, 2018 to 31st March, 2019. Book Now. Weekend Escapes, Rooms from INR 12,000 Per Night. Weekend Escapes, Rooms from INR 12,000 per night + Daily breakfast + Returns transfers Oberoi Hotels & Resorts, India. Check in for the weekend at a luxury urban sanctuary with Oberoi Hotels. Discover the perfect escape from a busy schedule and the rush of a bustling city. Relax. Switch off. Unwind. Offer valid from 1st October, 2018 - 31st March, 2019. Book Now. Suite Experiences from INR 17,500!! Suite Experiences from INR 17,500 + Buffet breakfast + Airport transfers Oberoi Hotels, India. Suite Experiences - Indulge in a Suite Experiences and enjoy exquisite luxury, our legendary hospitality and a host of exclusive, complimentary benefits. Allow us to welcome you with a service that is warm, personalised and anticipates your every need. Offer valid from 1st October, 2018 - 31st March, 2019. Book Now. Golf Offer, Rooms from INR 28,500/night. Golf Offer, Rooms from INR 28,500/night + Daily breakfast The Oberoi Sukhvilas Resort & Spa, Chandigarh, India. Stay & Play - Thirty minutes from central Chandigarh, The Oberoi Sukhvilas Resort & Spa is perfectly located for you to enjoy a round of golf at The Chandigarh Golf Course. Situated in the foothills of the Shivalik mountains next to Sukhna Lake, the beautiful golf course is known for its tight fairways and the famous 613 yards par-5 at the 7th hole. Offer valid from 1st October, 2018 to 31st March, 2019. Oberoi Hotels & Resorts - The Oberoi Group, founded in 1934, operates 31 hotels, Nile Cruisers and a Motor Vessel in the backwaters of Kerala. 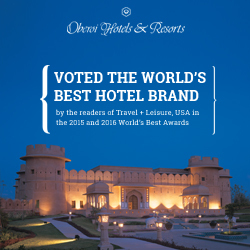 The Group has presence in six countries under the luxury 'Oberoi' and five-star 'Trident' brand. The Group is also engaged in flight catering, airport restaurants, travel and tour services, car rentals, project management and corporate air charters. Trident hotels are five-star hotels that have established a reputation for excellence and are acknowledged for offering quality and value. These hotels combine state of the art facilities with dependable service in a caring environment, presenting the ideal choice for business and leisure travellers.